CONNECTIVITY MATTERS 1 6 | B R O A D B A N D C O M M U N I T I E S | w w w. b r o a d b a n d c o m m u n i t i e s . c o m | A U G U S T / S E P T E M B E R 2 0 1 8 Benefits and Challenges Of Regional Broadband For rural communities struggling to connect to the internet, working together at any point in the process can yield benefits. By Trevor Jones / OTELCO C onnecting rural communities to the internet is a significant challenge. Communities all around the country are rising to the challenge and building networks of their own. In many cases, communities have found benefits to working together in a regional fashion; in others, the political and organizational challenges of regional cooperation have forced towns to go it alone, at least at first. For those that have not moved forward yet, the benefits of banding together are great enough to work through the political and organizational challenges. At the end of the day, working together will make taxpayer dollars go farther and create opportunities to connect people where it might have been impossible because of lack of scale, distance from the middle-mile network, and low population density. For those that decided to move forward alone, it is never too late to find ways to work together. Interconnecting networks can achieve added network diversity and reliability. Pooling resources can improve leverage for the purchase of wholesale internet connectivity, middle-mile transport and other needed services – especially at contract renewal time. • Extending the middle mile. Maine's ree Ring Binder middle-mile network consists of three interconnected rings that offer great reliability and diversity. Unfortunately, it doesn't connect to all of Maine's underserved communities. is leaves many towns with the need to build through a neighboring community or two to get to the middle mile. By working together, towns can share the cost of connecting to a middle mile that isn't nearby. Several regional groups in Maine are currently grappling with this issue and others by working together. • Achieving middle-mile route diversity and redundancy. Towns can work together to develop regional networks and make internet service more reliable for their constituents even if their last-mile builds occur at different times. Case in point: Leverett and Shutesbury, Massachusetts. e MassBroadband 123 network connects all 123 towns in the Western Hills, but most of those towns, including Leverett and Shutesbury, are connected by a single fiber path. Leverett, one of the earliest successful municipal broadband projects in Western Massachusetts, is now talking to its neighbor Shutesbury about connecting Leverett's gigabit last-mile fiber network with the last-mile fiber network Shutesbury is currently constructing to provide a second middle-mile path for both towns, improving reliability throughout the area. • Achieving scale. For the last few months, I've been engaged with the Western Massachusetts towns of Florida, Hawley, Savoy and Monroe about building a multiplatform, fixed wireless network throughout the region. e combined total population of these communities in 2016 was approximately 1,850, which translates to fewer than 1,000 potential households. Individually, it would be difficult for any one location to justify building a broadband network, as the costs of the middle mile, construction and operation would be too great. Collectively, they are planning a broadband network with diverse middle-mile connections serving 96 percent or more of their population. • Leveraging wireless. e funny thing about wireless signals is that they don't obey town boundaries (or any boundary) very well. e Florida-Hawley-Savoy-Monroe network will take advantage of this fact by connecting people in one town with towers in another. 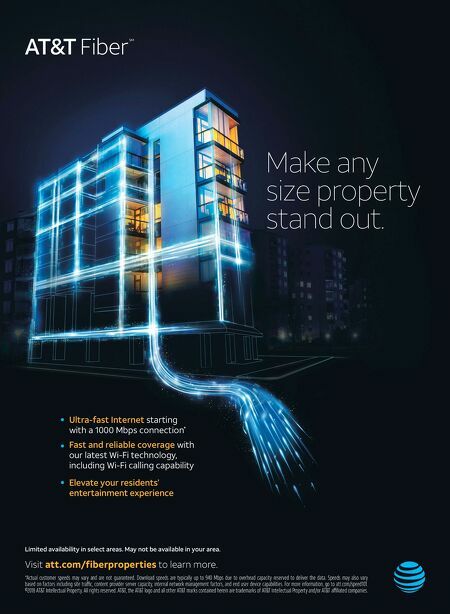 Scale is key with wireless networks. e broader the geographic coverage, the more efficient the network. 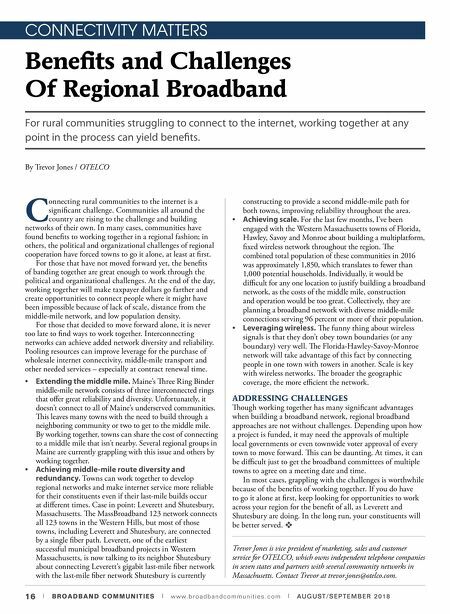 ADDRESSING CHALLENGES ough working together has many significant advantages when building a broadband network, regional broadband approaches are not without challenges. Depending upon how a project is funded, it may need the approvals of multiple local governments or even townwide voter approval of every town to move forward. is can be daunting. At times, it can be difficult just to get the broadband committees of multiple towns to agree on a meeting date and time. In most cases, grappling with the challenges is worthwhile because of the benefits of working together. If you do have to go it alone at first, keep looking for opportunities to work across your region for the benefit of all, as Leverett and Shutesbury are doing. In the long run, your constituents will be better served. v Trevor Jones is vice president of marketing, sales and customer service for OTELCO, which owns independent telephone companies in seven states and partners with several community networks in Massachusetts. Contact Trevor at trevor.jones@otelco.com.